Important note: Schema service is a feature available only in the Couchbase Enterprise Edition. Unless N1QL is disabled plus REST API is enabled, Hackolade Reverse-Engineering will not function properly. Authentication is the process of verifying the identity of a client. When access control, i.e. authorization, is enabled, Couchbase requires clients to authenticate themselves in order to allow access. v4.x: we use read-only credentials combined with bucket name/password if any: the bucket name/password needs to be filled in Connection tab, while the Read-Only username/password is entered in the Authentication tab. This is required, as per: "Couchbase requires Cluster level authentication for certain REST commands and Bucket level for others"
As per https://forums.couchbase.com/t/creating-secondary-index/12783/3 : "A primary index of N1QL will allow you to query any field of your JSON. As such, it takes up more space and is less efficient (but much more flexible). It is the basic requirement to be able to use the query language on your data. A secondary index of N1QL is targeted at specific field(s) and will be more performant for queries involving these fields (because the index to scan will be shorter and more to the point)." For access to a Couchbase instance in the Cloud, you may need SSH tunneling. 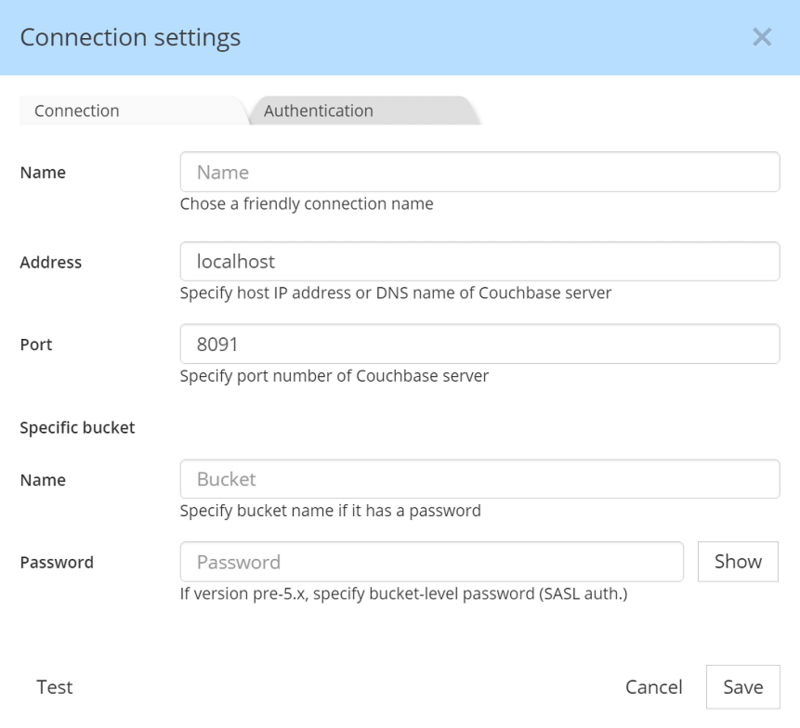 For buckets on Couchbase versions 3.0 through 4.6, if the a password has been set at the bucket level, it is necessary to create one connection setting per bucket, and provide the bucket name and password. Important note: If the N1QL service is not running, it is required to provide BOTH the bucket name/password AND the read-only username/password. These parameters are assembled by Hackolade to create the full connection string when establishing the connection during the Reverse-Engineering process.